The UnyTouch Stingray Series has been discontinued. No direct replacement is available. 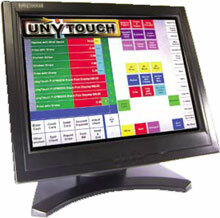 UnyTouch's new Stingray line of stylish touch screens are the slimmest available. Beautifully designed and with the same durable 5 wire resistive technology UnyTouch is known for, these screens set the standard for style and function. Ped 3 base is standard.